This is my 4th year as the teacher of 7th and 8th grade students at The Peak School, a charter school in Flagstaff, Arizona, where 165 students attend K-8. During my time here I have discovered that food crosses cultural and economic differences, is a passion for young teens, and simplifies team building while bringing pride to all the individuals. During my 2nd year of teaching I decided to turn the desks into the kitchen! One of my strongest goals as a teacher of students this age is to strengthen the parent/student relationship, as this is essential for success in high school. Therefore I decided to schedule a Saturday cooking-class brunch. 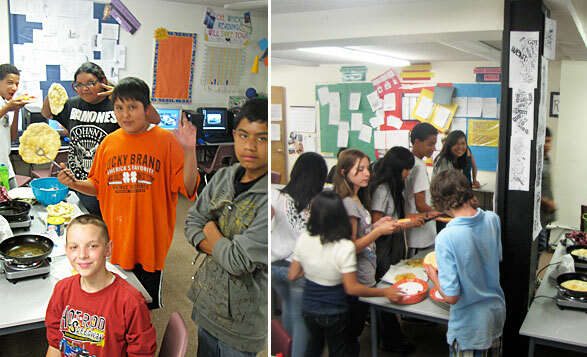 Students and parents came to the classroom where they were shown how to make Stuffed French Toast. Ingredients came as donations from the corner market, and the electric griddle and kitchen tools came from my own kitchen. Desks were turned into cloth covered tables, where students ate with their parents. A year later, I heard that Stuffed French Toast became a family tradition after that day. During her 8th grade year, one of my Native American students was found to be medically at risk of developing diabetes. With that, showing Food Revolution episodes was added to the year-long plan. Food consciousness seems to grow each year in my class! This year, the big theme is environmental and social sustainability. Cooking as a family is a relevant factor for both. I have learned that cooking in our academic classroom promotes cooking at home. The students vote to determine what we will cook together each month and I add it to the calendar at the back of our classroom. We create an ingredient signup sheet the week before to assure that we have what we need, and that no family is overburdened. We have 4 electric hot plates now, and students bring in needed pots and pans. I bring in utensils, cutting boards, a wash-bowl, dishrags and dishtowels, and the electric griddle as needed. So far this year we have made mixed fruit salad, Navajo Tacos with our own fried bread, and Cinnamon Pumpkin Pancakes for October. This group of students works together so smoothly when we are cooking and this carries over to all aspects of the classroom. As a teacher of history, math, language arts, and science, as well as a love for art, I am thrilled to be able to incorporate my creativity into all my subjects because I know these students are a team. We will find out in November about a grant, for which I applied this past Summer, which could fund a project to study environmental sustainability, water reclamation, native plant restoration, human habits of composting and greenhouse gardening. The ultimate goal of the project will be to plant a herb pot for every Peak School family, from herbs sprouted in compost, by our class. About the author: Elli Chapman is a teacher of 7th and 8th graders at the Peak School, a charter school in Flagstaff, Arizona. She has lived in Flagstaff for 19 years, been a mother for 18, a vegetarian for 12 and teacher for 4. Her mission as an educator is to teach students to invest in themselves in all ways possible, and that eating, as a method used every day, is something over which they have tremendous power. Original article on Jamie Oliver website.